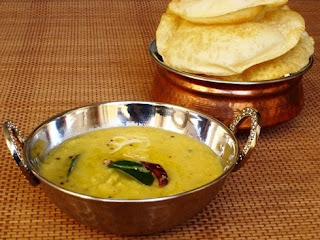 Take a thick pan and add the above moong dal and heat it well.when it is well heated wash well the dried red chilli and add in it along with the water and cook well. Take the grated coconut and add jeera in it and grind well and mix it in the cooked dal. Switch off the flame thereafter take a pan and add coconut oil and splutter mustard seeds and curry leaves in it. And add it to the dal cooked. Be aware that the water should not excess.